Now that battlefront is done do you still play or are you waiting for battlefront 2? Anyone here use steam as well as their console? I know how much you guys love polls so I made one regarding skirmish. News just got dropped if you haven't seen it yet. Prediction when the next update is? I got to say that I love skirmish at least twice as much if not more now. It's that time of year for the scares and chills anyone got some good horror Netflix movies? Anyone want to play a cards against humanity game sometime? (Immature game not going to lie). Does anyone know when DS dlc is available for non SP holders? How rewarding is it going to feel when you blow up the Death Star? Yesterday I watched H ell and back and let me tell you it's not bad. A question about Star Wars I have always had. Does anyone sometimes use saber rush for transportation? A quick Question regarding Greedo. This might be too early to ask, but do you think RO will have its own unique mode? Is it just me or do hero pickups work better on skirmish now? What do you think the maps for the Death Star dlc will be like? Can we please have a Dale Gribble emote on all sand maps? Is it just me or is it rare seeing shadow trooper players now? Are there some shows that you watched as a kid that you would watch still? Can anyone name this game? Do you think we might be able to see Bothans as a species in this game at some point? To those that added me for a blast private match let's pick a date and time everyone can do. Does watching the movies build up hype for battlefront? 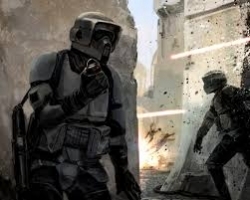 In the lore of the OT were there any really skilled snipers that worked for the empire? Lower hero survival rate on normal difficulty in skirmish.